Lucie and I are avid golfers, so being able to get a round in before, during or after a visit tot he cottage is always a great plus. ...and we found this great 9-hole course which is on the way up to the cottage (just off highway 148) and only a half hour from the cottage. It is in Norway Bay from which it gets its name. World famous golf course architects Stanley Thompson and Robert Trent Jones designed this beautiful course in the 1930's and the course still reflects both their influence and the rich golf history of the era. In May 2007, brother and sister, Linda and Jim Thompson and their families, purchased this historical golf club from the McCredie family. The course was acquired with the idea of complementing another 1930's historical resort property they have owned since 1969, called Pine Lodge in Bristol, Quebec. 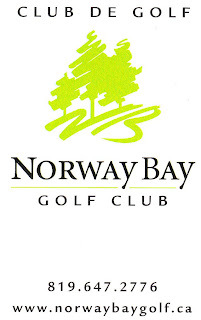 Since May, 2007, they have been in the process of rejuvenating and injecting new life into this "proud old Norway Bay lady" to bring it back to its original splendor. We have played two rounds of golf, and we will be back again. If you are in the area give it a try!